Notes: Although Bronwydd Arms station served the village of Bronwydd, it took its name from the nearby pub which predated the village. Before the sixteenth Century the Bronwydd Estate of Henllan near Newcastle Emlyn owned vast areas of land in west Wales. On part of that land, at the junction of three roads three miles north of Carmarthen, the Bronwydd Arms opened its doors and eventually gave its name to the whole area. Though demolished in 1981, a plaque at the spot commemorates the old public house. The station was not ready when the line opened to a temporary terminus at Conwil on 30 September 1860, and it first appeared in company timetables in October 1861. The February 1863 Bradshaw (reproduced on the Conwil page) shows 9 trains in each direction between Carmarthen Junction and Carmarthen. Only two if them run through to Bronwydd Arms and Conwyll, one mid morning and one mid afternoon. There was no Sunday service to Conwyll. Bronwydd Arms was sited on a bend on the north side of the level crossing over what is now the B4031. The station had a single platform on the up side of the line with very modest facilities which included a small brick and timber building with a hipped slate roof which overhung the front of the building to form a canopy. The building contained the booking office, waiting room, and a gents' toilet which discharged directly into the nearby stream. The ladies’ toilet was in a separate slate-roofed building nearby. After demolition, the stone from this building was used to strengthen the river wall on the other side of the road. A small corrugated iron building with double doors next to the station building was a parcels store. There was a goods loop with two short sidings opposite the platform. The small goods yard handled general goods, parcels and livestock. A signal box on the north side of the crossing on the down side controlled the crossing and access to the yard; road access was behind the signal box, with a weighbridge just inside the entrance to the yard. There was a crossing keeper's hut on the opposite side of the road. The goods yard closed on 2 December 1963, and the sidings and loop were lifted shortly afterwards. The 1889 map, reproduced below, shows a longer building identified as the village post office on the site of the signal box. By 1906 the smaller signal box is shown, and the post office has been relocated to a new building on the opposite side of the crossing. It is not known if this earlier building was also a signal box or just a post office. 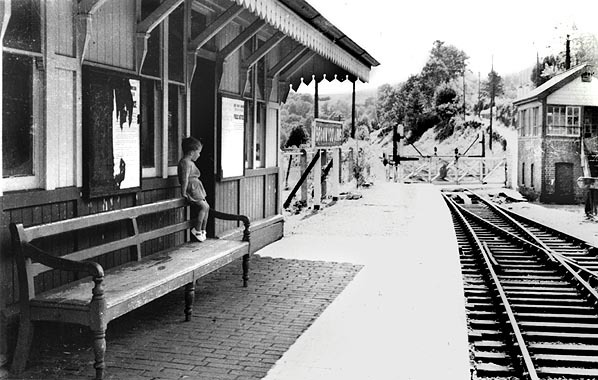 After closure to passengers in 1965 the station buildings were demolished, although the line remained open for milk traffic until early 1973. 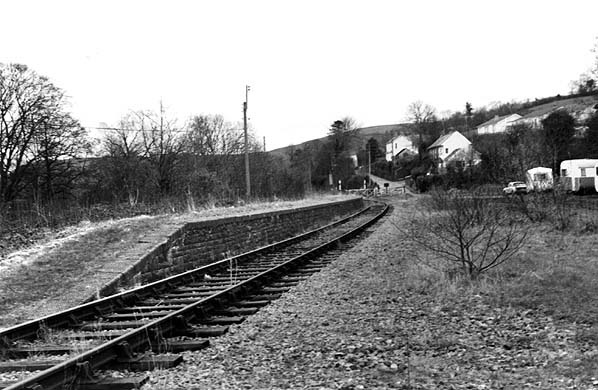 Track-lifting began in 1975, but never reached Bronwydd Arms as the trackbed between Abergwili Junction and Llanpumpsaint was sold to the Gwili Steam Railway. By the time they took over, Bronwydd Arms, which was to become their headquarters, was in a very dilapidated state with only the platform, track and single-gated level crossing remaining. 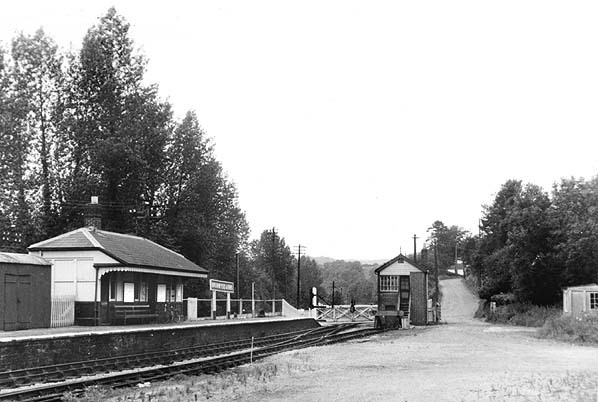 Over three years the station was gradually rebuilt, with a new station building and signal box using redundant structures recovered from the ’Heart of Wales’ line. 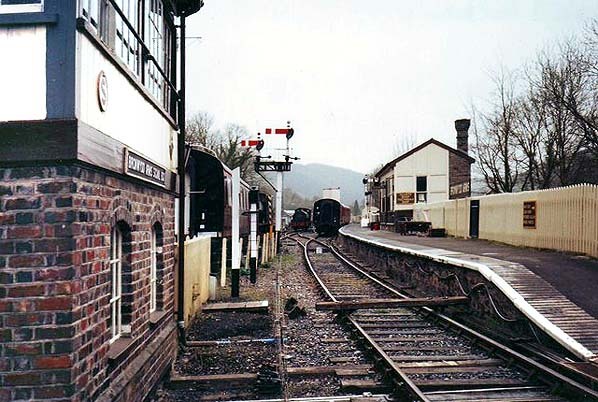 The station building is constructed from Llandovery signal box, while the signal box from Llandybie is the 'new' Bronwydd Arms signal box. A third box from Ffairfach is also in use as a museum. The goods loop and sidings were re laid. The station, which has been painted in typical GWR colours, was reopened on 25 March 1978 but restoration has continued. A number of smaller items have been incorporated into the rebuilt station, such as GWR lamp posts and benches, reproduction station signs, a parcels shed, and a water tower recovered from Barry Docks in 1979. Passenger trains do not currently use the level crossing, but it will be brought into use when the railway's extension to Carmarthen is completed. In 2010 work started to renew the level crossing to enable the original two-gate system to be reinstated in GWR style, thus re-creating another feature of the original station; this work was completed in August 2011.
service was suspended on 31 December 1860. The company then hired two 4-4-0 tank engines and reopened the line with its own rolling stock on 15 August 1861. In October 1861 Bronwydd Arms, a new station between Carmarthen and Conwil, first appeared in company timetables. 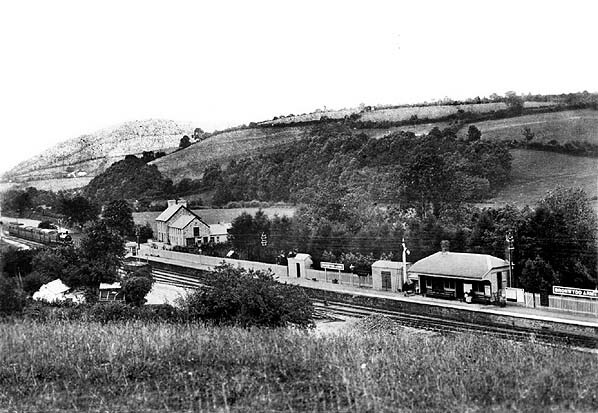 A southbound passenger train approaches Bronwydd Arms station in June 1909. The modest station building, which incorporated the booking office and waiting room, is seen on the right. The building next to it is a parcels store. 1906 1:2,500 OS map. On first appearance there is little difference between the two maps. The signal box is seen at the entrance to the goods yard, but on the 1889 map it is a longer building that includes the village post office. By 1906 the post office has moved. The 1906 map also shows a weighbridge, weigh office and another small building in the goods yard, Neither map shows any buildings on the platform. 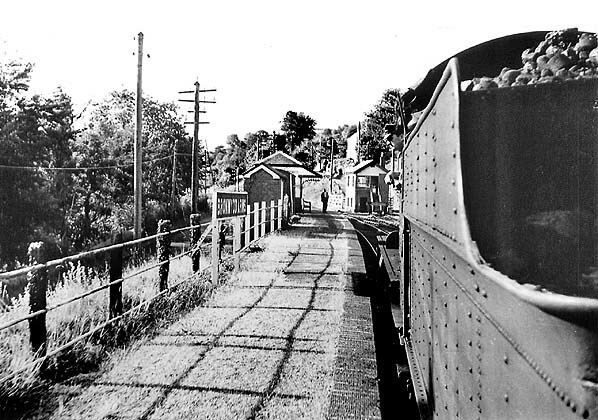 Bronwydd Arms station and level crossing seen from the goods yard in July 1956. The entrance to the yard is to the right of the signal box; the weighbridge and office are on the right. The building to the left of the station building is a parcels store. Bronwydd Arms station looking north from the level crossing in 1962, a northbound passenger train has just left the station. Some goods wagons are seen in the loop and siding on the left. 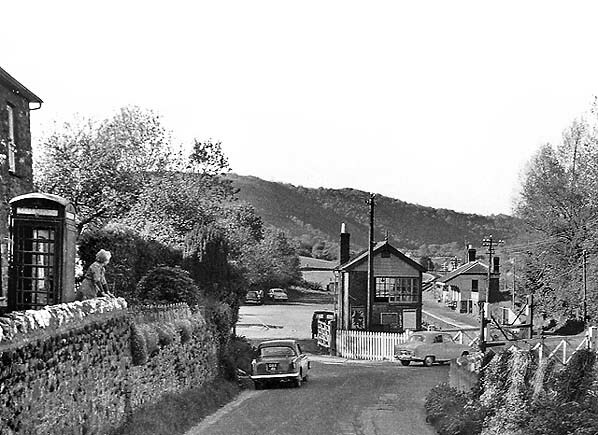 Bronwydd Arms station and level crossing in June 1962. The gate to the left of the signal box is the entrance to the goods yard. There was a weighbridge just out of view to the left. The yard was served by a loop and two short sidings out of view behind the signal box. 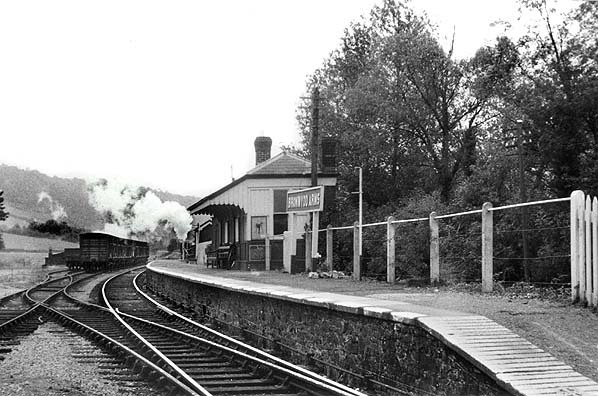 A southbound train pulls into Bronwydd Arms station in September 1963. 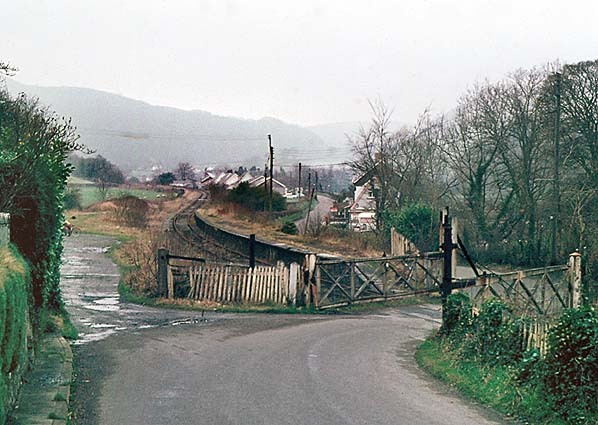 Bronwydd Arms station, looking south from the goods yard in April 1975, two years after complete closure of the line. The signal box has now also been demolished. 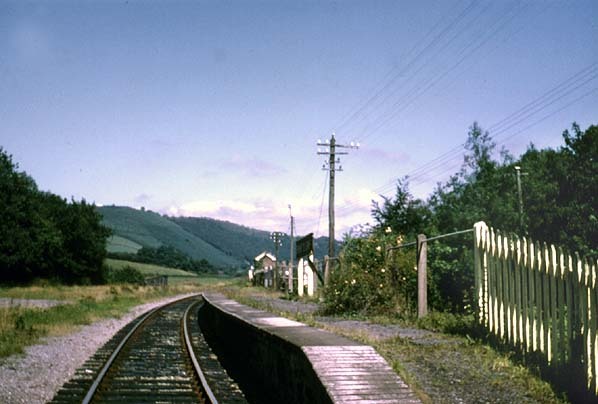 Bronwydd Arms station looking north in March 1976. The station is now looking very dilapidated but is awaiting restoration by the Gwili Steam Railway which was to start soon after this picture was taken. Gloucester RCW class 100 DTCL no. 56317 in use as an observation car at Bronwydd Arms during the 1979 season, the second year of operation. This DMU never operated under its own power. 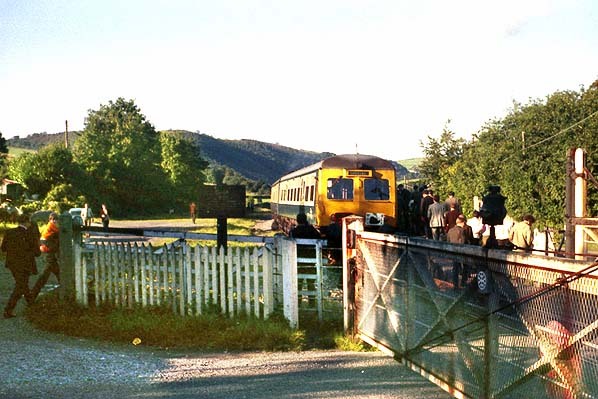 Bronwydd Arms station looking north from the level crossing in April 1995. The loop and sidings have been re laid and a new signal box erected. The sleeper across the track indicates that trains must not proceed over the level crossing. The station has been restored in traditional GWR colours. The former Llandybie signal box, which was built in 1885, is open to the public. 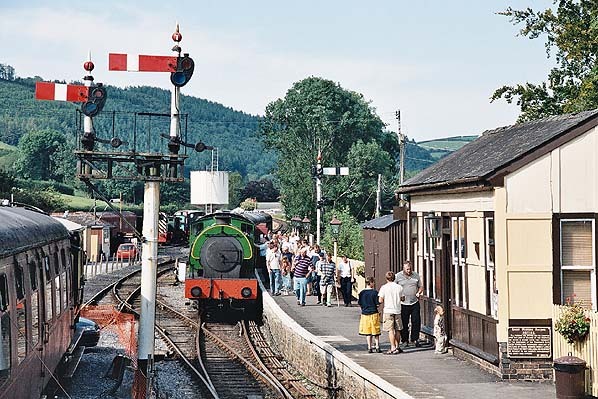 A busy summer day at Bronwydd Arms station in August 2007. 'Haulwen' has just arrived hauling a service from Dan-y-coed and Llwyfan Cerrig. BR Class 117 DMU at Bronwydd Arms station in June 2011. 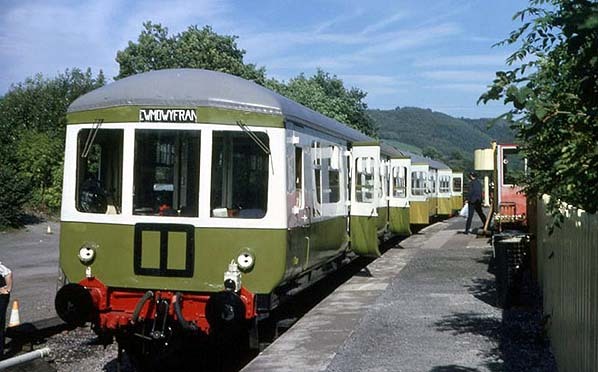 After the departure of the Class 100 DMU in the 1990's the Gwili Steam Railway was without a DMU for 15 years until the arrival of this 3-car set. 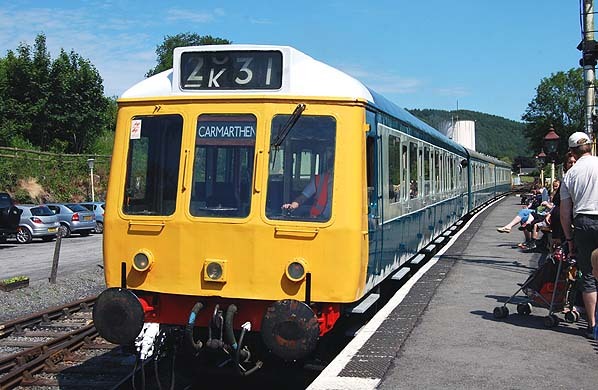 Carmarthen as a destination is probably some years away.